A favorite of ours is "chicken fried" anything. 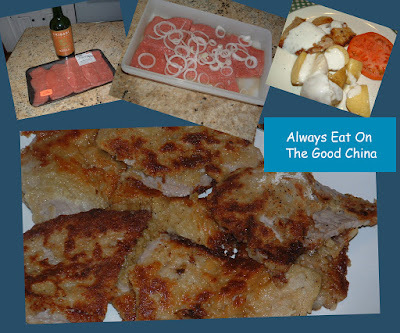 Chicken-fried steak (also known as pan-fried steak country-fried steak or CFS) is a piece of steak (tenderized cube steak) coated with seasoned flour and pan-fried. It is generally associated with the South and their hospitality. 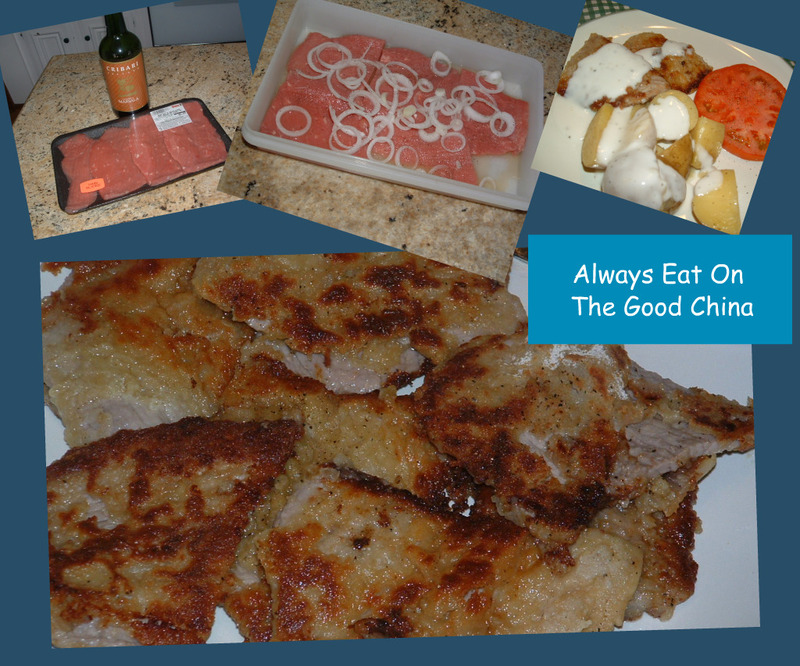 Its name is thought to be likely due to chicken-fried steak's similarity in preparation to fried chicken, though the dish is also similar to the classic Austrian dish, Wiener Schnitzel, a tenderized veal or beef cutlet, coated with flour, eggs, and breadcrumbs and then pan fried. It is truly a comfort food. The precise origins of Chicken Fried Steak are unclear, but many sources attribute its development to Germans and Austrians who immigrated to Texas in the nineteenth century and brought recipes for Wiener Schnitzel from Europe to the USA. Lamesa, the seat of Dawson County on the Texas South Plains, claims to be the birthplace of chicken-fried steak, as does Bandera, Texas' favorite son, John "White Gravy" Neutzling. The Virginia Housewife, published in 1838 by Mary Randolph has a recipe for veal cutlets that is one of the earliest known recipes for a food like chicken-fried steak. The recipe for what we now know as chicken-fried steak was included in many regional cookbooks by the late nineteenth century. The actual term "chicken-fried steak" was probably developed in the 1930s. It is thought that the name change was due to the war with Germany. Chicken-fried steak is among numerous popular dishes which make up the official state meal of Oklahoma, added to the list in 1988. All that said, even being a Texan, I grew up with it being called Country Fried Steak which makes so much more sense to me! There is nothing chicken about this meal. I have over the years played with the flavor and this is how we like it. Generously salt and pepper the steaks. Slice your onions and marinate the steaks in just enough Marsala wine to cover. Layer the steaks and onions into a tupperware and refrigerate for several hours. Drain steaks on paper towels. Heat large skillet with enough butter to evenly coat the bottom. Dipped drained steaks in beaten egg and then flour. Lay each steak in sizzling butter and salt and pepper again. Turn steaks and season again. Serve with Parmesan Potatoes and Peppered Gravy. Mmmmm my favorite! I will have to try your recipe next time.